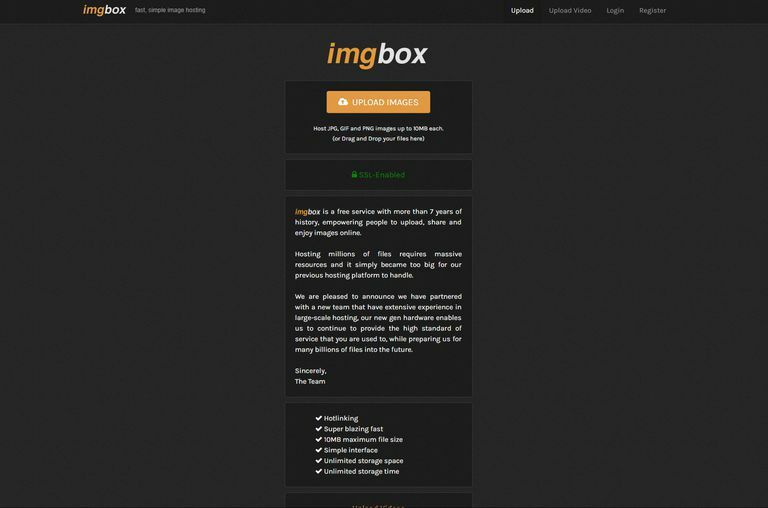 imgbox is a free image hosting service that stores your photos for a lifetime. You can link directly to the full sized images you upload and not be restricted by bandwidth limitations. Unlike some photo hosting sites, you don't don't have to create a free account with imgbox.com, which means you can start uploading your pictures right away. Imgbox lets you upload the following file types: GIF (still or animated), JPG, PNG. Anything else gets rejected, as you can see above. If you have a file in a different format, like PSD or TIF, and want to upload it to imgbox, you have to use an image converter to convert the file to one of the acceptable formats listed above. Zamzar and FileZigZag are two examples of websites that can convert images to these formats. Any image you upload to imgbox must not exceed the 10 MB file size limit. If you need a bigger size limitation, try Imgur. Unless the terms of service are violated, photos have no storage expiration date. This sounds just like it seems: images you upload to imgbox have no definite end-of-life period, so you don't have to worry that they'll be taken down after so-many days, months, etc. 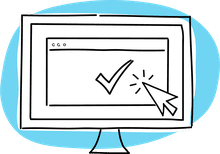 Registration for a user account at imgbox is completely free, and lets you do a few things you can't do as an anonymous user. Without a user account, when you upload images to imgbox, you're constantly asked if your images are family safe or contain adult content. You're also asked what size of a thumbnail to create, whether to enable comments and what (if any) gallery the pictures should be added to. If you find yourself changing these settings to the same options with each and every upload, just make a free account to define the default upload settings. An imgbox account also lets you easily delete your uploads, edit galleries, and comment on photos uploaded by other users. For a free image hosting service to not impose an expiration on photos is wonderful. This means you can upload your photos and not worry about them becoming unusable because of little to no activity or because too much time has passed since it was uploaded. I say above that images you upload to imgbox retain their original name and extension. This means if you upload an image called portrait.png, it will also be downloaded as such when someone decides to save your image. I like that this is the case so it's easy to identify the pictures given that there aren't any title or description settings on imgbox. Something I don't like is that imgbox doesn't support other image file formats like TIFF, BMP, PSD, etc. Most other image hosting websites accept more than imgbox's mere three file types, but at least the ones that are supported are probably enough for most people.